Sēo Grundgesetnes þāra Geānedra Rīca American is sēo ealdru ǣ þāra Geānedra Rīca American. Eall riht in þæm rīcum stent under þisse ǣ and sceall gerisnian þærmid. Þēos Grundgesetnes hæfþ , and hēo hæfþ gewyrht on manigum þēodra grundgesetnessum. Se dōmlica, þærof sind se Ealdordōmærn and fyrðre geþoftscipes rihtærn. Sēo Grundgesetnes in his fruman timbre is on fēower trametum þā sind bōcfel. Se form þrēo word sind "We the people", se is "We se folc" and man hycgð ðe swylce word asēðað þe þāra Geānedra Rīca lēodweard gestandeþ to þegnienne his burgmenn. Þēos Grundgesetnes wæs sēo forma gesetnes of its kind, adopted be þæs folces spelum for brādum and brǣdendum þēode. Hēo is areaht, beēaned and forþgegangen be miclum gesetnesshēap and manigum rihtdōmum. Se Fēowerþa Mǣl, se Fifta Mǣl and se Siexta Mǣl staþolaþ þā lāre of geþoftfæstnesse. He sceawaþ þā riht and glemen þāra rīcu and hiera lēodwearda in midwist mid þæm gædes lēodwearde. Se Sēofenþa Mǣl gestaðoleþ þone rihtgang þærbe mōtan þā þrēotīene rīcu fæstnian þā Grundgesetnes. Siððan ðe sēo Grundgesetnes weard frumfull in 1789 hæfþ man hie bētredon on sēofen and twentig cyrrum mētlice þan weax þæt rīce and þēod and in nīwum yldum. Betrunga þære Grundgesetnesse þāra Geānedra Rīca Amenican sindon gerwiten on þæm gewrite æt hsi ende. In folclicre sprǣce hattan þā ǣrrestan tiene betrunga se Rihtgewrit þāra Geānedra Rīca American, and þās betrunga giefaþ sundor weard of mannes syndrige frēodōme and rihte and hie settað bond on þæs lēodwerades cræfte. Onmang þæm sēofentiene later amendments, se micla dæl expand mannes riht and freoðowaru. Elleswīse hie address issues related to federal authority or modify government processes and procedures. ↑ Differences between Parchment, Vellum and Paper (August 15, 2016). ↑ United States Senate (1992). 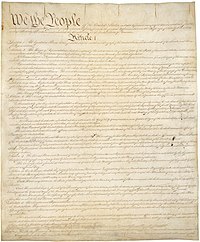 "Amendments to the Constitution of the United States of America", The Constitution of the United States of America: Analysis and Interpretation (PDF), U.S. Government Printing Office. ISBN 9780160632686. ↑ Constitution Day. United States Senate. Begieten on September 10, 2016. Man nīwanost wende þisne tramet on þǣre 09:03 tīde þæs 17 Þrimilcemōnaþ 2017.